(Newser) – The Venti Pike Place coffee cost her about $2.50. It ended up costing Starbucks about 40,000 times that. In the latest hot-coffee lawsuit, a Florida woman was awarded $100,492 Thursday after a 2014 incident at a Starbucks drive-thru in Jacksonville left her physically scarred, reports the New York Post. According to defense lawyers, Joanne Mogavero, a 43-year-old mother of three, had received a cup of coffee from a barista and was attempting to hand it to a passenger when the lid popped off and the 190-degree drink spilled in her lap, leaving her with permanent scarring from first and second-degree burns. I guess someone hit the STARBUCKS lottery for $2.50! 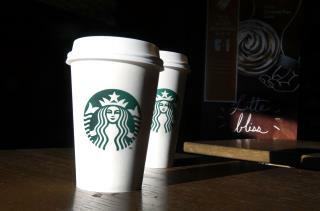 Now STARBUCKS will have to make a CUP that are one piece CUP & COVER MOLDED together! A hollow form or matrix for giving a particular shape to something in a molten or plastic state.! Due to this Person not checking the Cover to make sure it's on there tightly! Have a nice day & There ya go ALL! "The Coffee Cost Her $2.50 AND A SERIOUS BURN ...that Cost Starbucks $100K." Don't be a sell out to the billion dollar insurance company.